CSX Corp., together with its subsidiaries based in Jacksonville, Fla., is one of the nation’s leading transportation suppliers. For nearly 190 years, CSX has played a critical role in economic expansion and industrial development across the eastern United States and into parts of Canada. With more than 2,700 miles of rail track and more than 2 million carloads handled in the state of Georgia alone, CSX maintains a busy schedule transporting loads along those lines as well as maintaining and inspecting the existing track areas to ensure deliveries, shipments and schedules are consistently met. 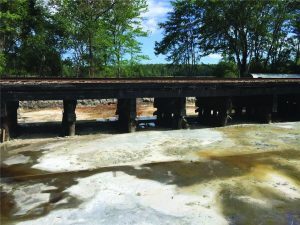 Along the track from Valdosta Yard to Homerville, Ga., CSX engineers noticed two timber-beam bridges that had severely deteriorated to the point where they were in need of replacement or repair. Upon identifying these two timber-beam bridges, CSX turned to STV Inc. to perform a hydraulics and hydrology capability assessment report to determine what options were available and what the best solution might be. The STV Jacksonville location worked closely with CSX to conduct the assessment report for the two timber-beam bridges in need of repair. 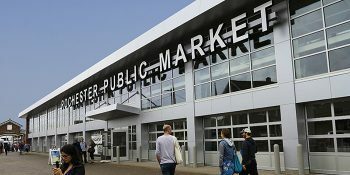 STV provided a report on the existing condition of the structures as well as a proposed condition and possible alternatives. The modeling and hydraulic analysis was performed to size the proposed structure and determine any change in flow from the existing condition to the proposed condition. To not delay the track schedule, CSX preferred a solution that would have as little negative impact as possible to the rail track. 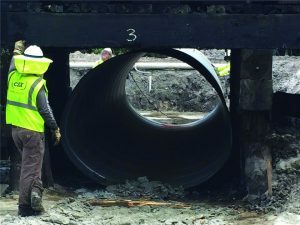 STV determined that slip-lining the existing structures with a multi-barrel corrugated steel pipe (CSP) culvert would be the most efficient and cost-effective solution. Determining the proper material type, size and shape that should be used for a particular site is a bit of science mixed with art. 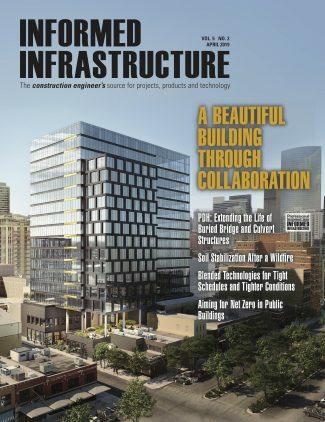 The evaluation process should consider the usual items considered for new structures, including loading requirements and other structural needs, hydraulics, velocities in the structure and at the outlet, material type and service-life needs, site-specific construction obstacles and accessibility limitations, contractor experience, grouting methods, etc. 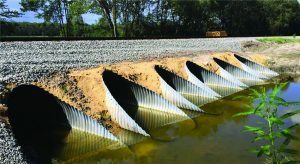 Not only did the proximity of the Contech manufacturing facility help cut costs considerably, but CSX was able to use its own track workers to de-water the area and slide the culverts into place before grouting and backfilling, which also severely reduced the cost of maintenance. 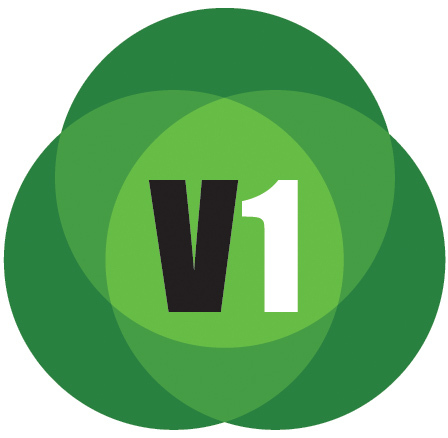 To help with this process, STV reached out to Contech Engineered Solutions for assistance in identifying the best product and design solution. 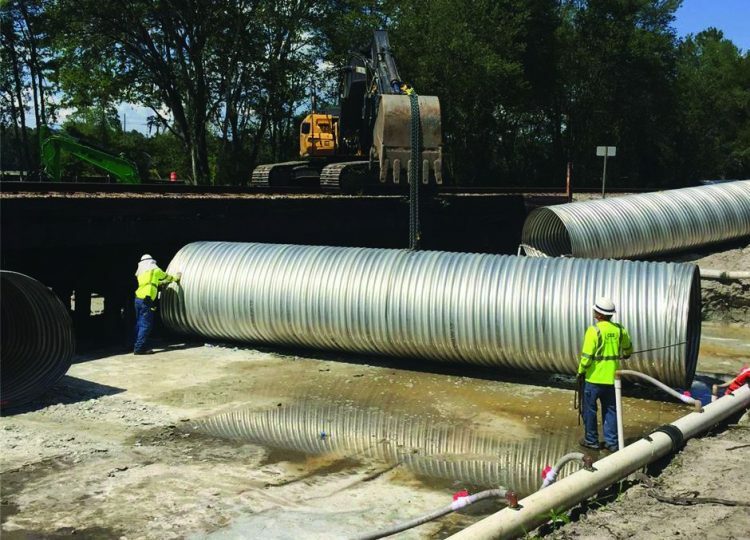 With more than 70 years of experience, Contech provides permanent, fully structural solutions based on time-proven designs, and it suggested using aluminized type 2 (ALT2), 10-gage HEL-COR® corrugated steel pipe (CSP) to reline the existing bridge structures. Contech was able to manufacture the HEL-COR® CSP at its local manufacturing plant in Conyers, Ga., to provide 72-inch-diameter, triple-barrel culverts to slip line under one of the wooden-beam bridges as well as another 78-inch-diameter, six-barrel, pipe-arch culvert under another wooden-beam bridge just a few yards down the track. They laid a slurried concrete slab down for improved working conditions and, with minimal delays to the track above, were able to finish the installation for a completely structural solution that would substantially extend the service-year life expectancy. Legal Issues: When (and How) Should a Mediator Evaluate a Case?